Sweet potatoes are an important part of my family’s real food diet. Did you know that sweet potatoes are a nutritional powerhouse? They contain ample amounts of Vitamins A, B, C and the mineral potassium. And, even though they have a sweet flavor, they are actually lower on the glycemic index than regular white potatoes. If you have discovered the awesomeness that is sweet potatoes you’ve probably run out of new ways to serve them, right? There’s roasted sweet potatoes, sweet potato fries, sweet potato soup, sweet potato casserole . . . I completely understand. So, here’s a new sweet potato recipe for you to try! 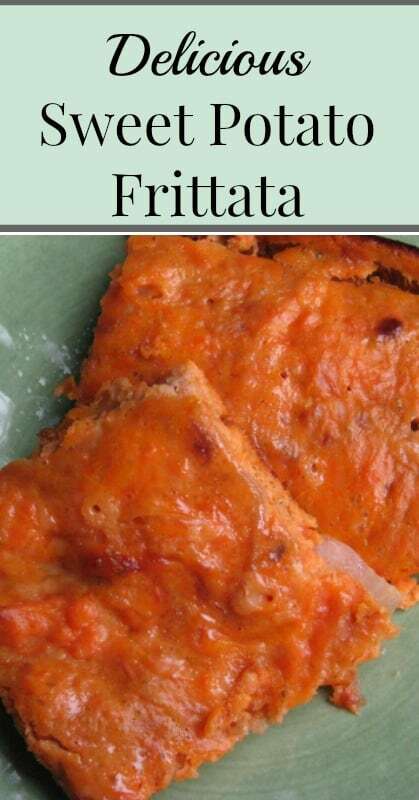 I was inspired by Healy Real Food Vegetarian’s Butternut Squash Frittata when I created my sweet potato frittata recipe. I wanted a way to make sweet potatoes the main event of the meal instead of being relegated to side-dish status. I also wanted non-muscle-meat protein in the meal. A sweet potato frittata was the perfect combination. I make two thin, casserole-dish sized frittata or two, thick pie-dish sized frittatas with this recipe. It feeds the whole family for dinner with leftovers for lunch the next day. The boys love it and I love that it’s filling and super-healthy. Prick the sweet potatoes with a fork to allow steam to be released when baking. Cook for 40-50 minutes, or until soft. Crack eggs into a large bowl and wisk. Add all ingredients except the sweet potatoes and wisk to combine. Peel the sweet potatoes and stir into the egg mixture. Pour mixture into 2 glass, 13 X 9 baking dishes. Bake for 30 minutes or until middle is set.